Comics Experience Blog: COMMUNITY NEWS: CE Alum Jeff Marsick Interviewed by Duane Swierczynski on Mulholland Books! 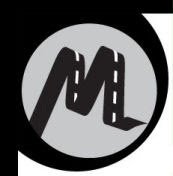 COMMUNITY NEWS: CE Alum Jeff Marsick Interviewed by Duane Swierczynski on Mulholland Books! 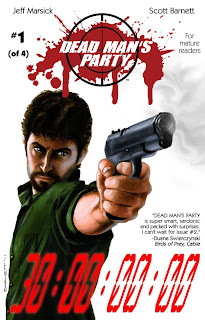 Writer and CE alum Jeff Marsick and artist Scott Barnett were just interviewed by Duane Swierczynski on the Mulholland Books website about their new comic book, Dead Man's Party. Dead Man's Party is about an assassin who puts a contract out on his own head to a select group of his peers. It's a party that will allow him to go out on his own terms, at the top of his game. The invitations are sent...and then things go horribly wrong. Interviewer Duane Swierczynski called Dead Man's Party, "one of the best single issues of a comic book I read last year...a fast-moving, lean and mean hit man thriller that contained some truly crazy surprises." In addition to Dead Man's Party, Jeff Marsick is also the writer of the comic Z-Girl and the 4 Tigers. 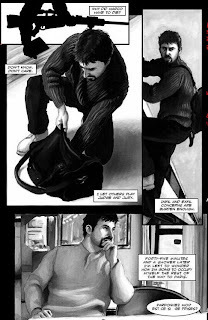 His artist collaborator on Dead Man's Party, Scott Barnett, has previously had work published by Image, Malibu, Chaos, Avatar, London Night Studios, and Topps, among others. In the interview, Jeff and Scott discuss the inspiration for Dead Man's Party, the planned length of the story, how they collaborate in the creative process, and much more! Mulholland Books is an imprint of Little, Brown and Company devoted to publishing the best in suspense fiction. Interviewer Duane Swierczynski is the author of several acclaimed crime thrillers, including Severance Package (Minotaur, 2008), which has been optioned by Lionsgate Films. Duane is also a regular writer on many Marvel Comics properties, and currently writes Birds of Prey for DC Comics.